Stack House Apartments surpassed industry standards – both locally and nationally – through many sustainable innovations and energy efficiency measures. 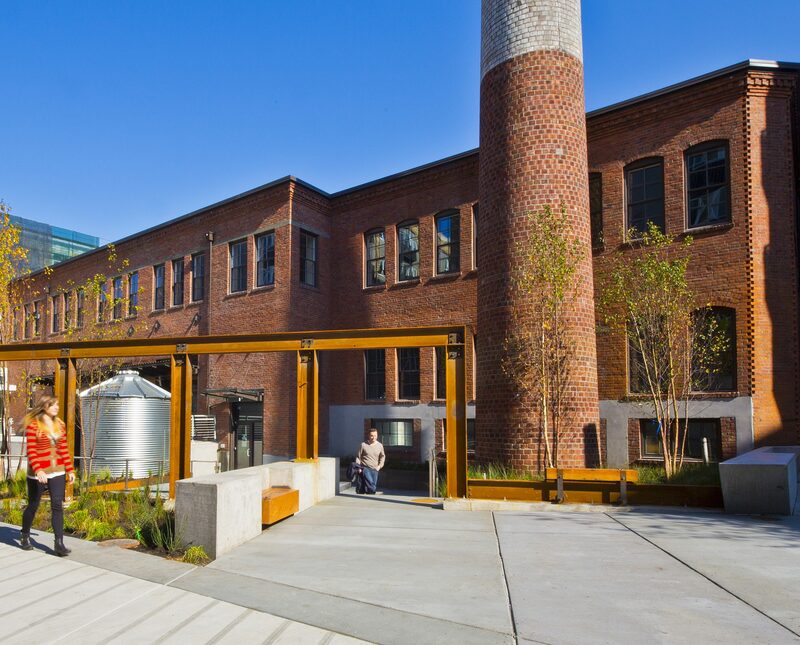 This full city-block project in Seattle’s evolving South Lake Union neighborhood combines two seven-story, mixed-use residential buildings with the restoration and adaptive reuse of the adjacent Supply Laundry Building, a historic landmark. 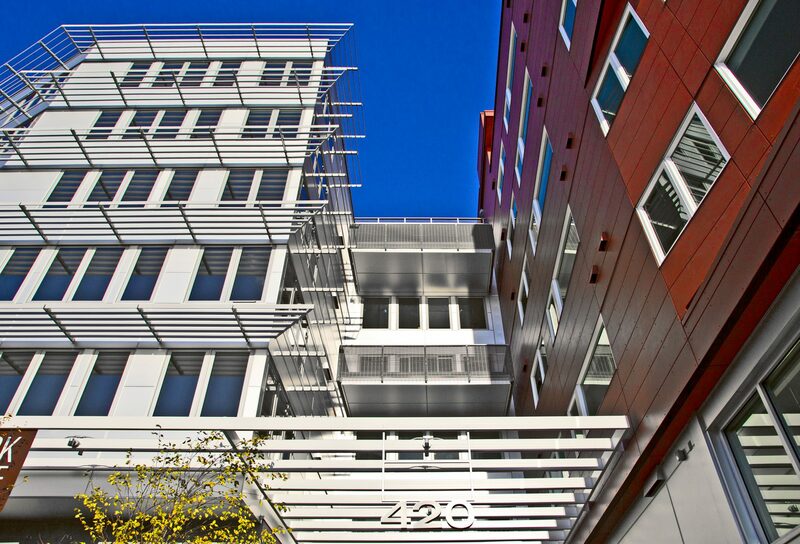 This project achieved LEED Platinum certification and met the Seattle 2030 District high-performance building challenge. 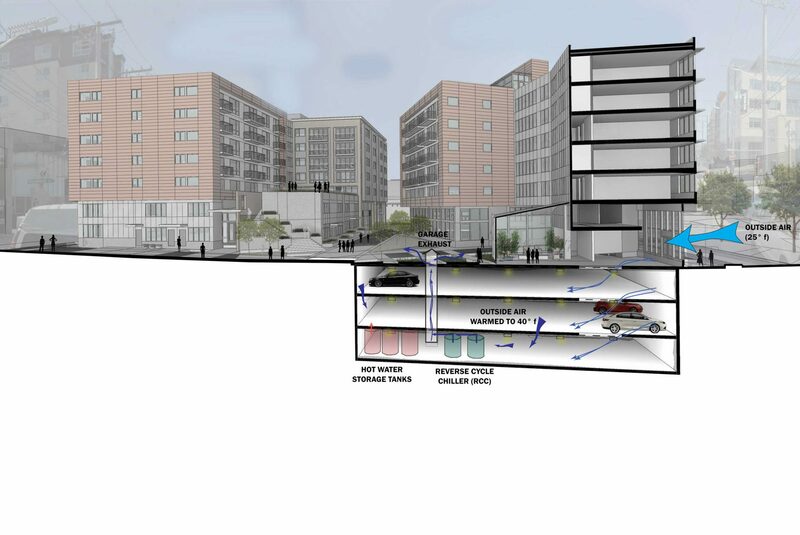 In addition, the Supply Laundry Building participated in Preservation Green Lab’s pilot program for outcome-based energy modeling and permit approval. The central heat pump water heating system uses RCCs to reduce electricity costs for the building. 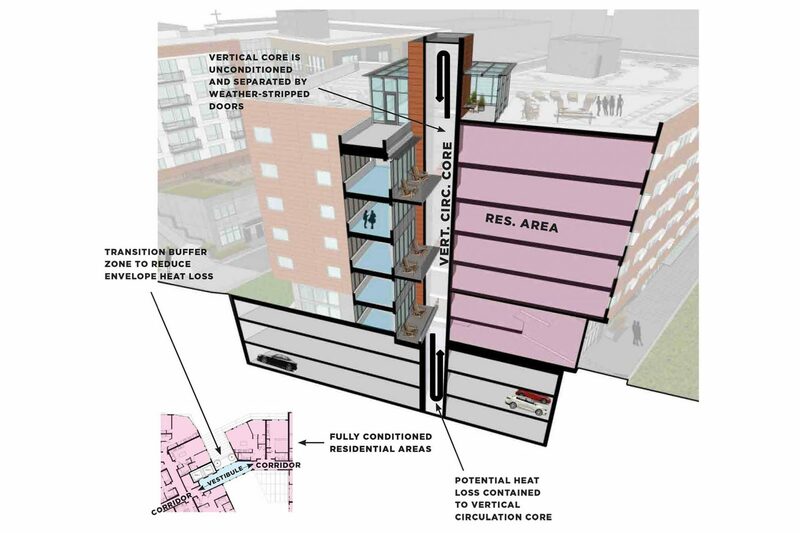 By using heat already created from underground parking, RCCs supply 100% of the energy needed to heat the domestic water for the building. – The RCCs reduce domestic hot water use by a factor of three. – Provides a simple six-year payback. – Allows significant downsizing of the garage exhaust fans. Compartmentalizing the central circulation areas significantly reduces envelope heat loss. It eliminates the leakiest portions of corridors from heat space and the natural ventilation cut the heating energy by 80% in corridors. This helps create a transition zone between the interior and the exterior. The elevator stack is isolated from corridors to eliminate the stack effect. The south and west facing units, which comprise 40% of the total apartments, have the highest seasonal cooling loads. By providing ductless heat pumps for these units, coupled with improved glazing, the heating energy loads are reduced by a factor of three. 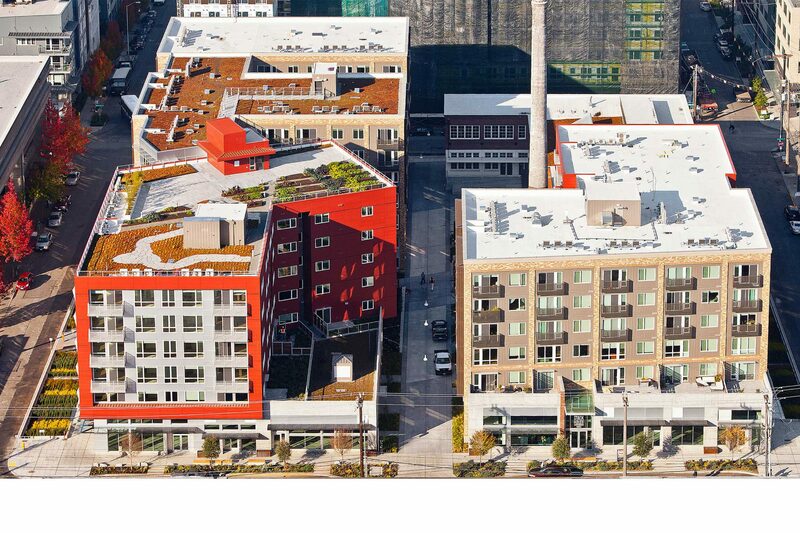 Stack House’s expansive green roof reduces urban heat island effect and filters rainwater. 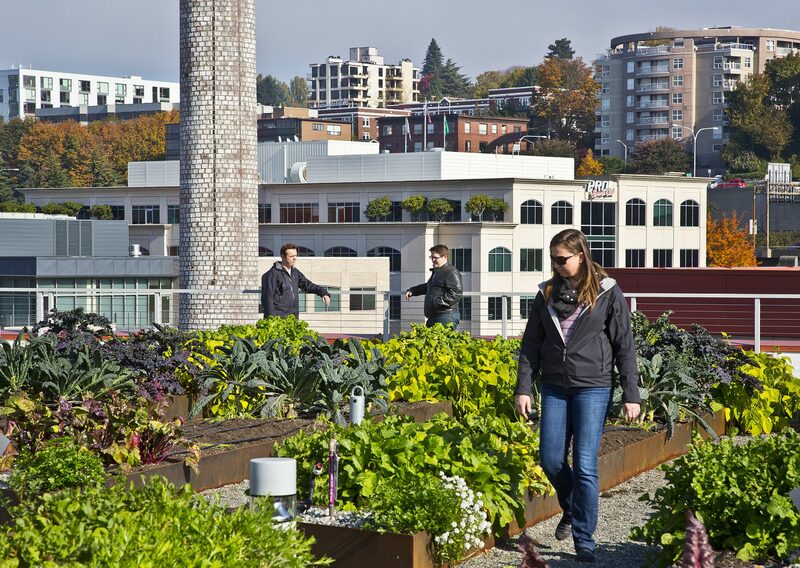 A portion of the green roof is also dedicated to urban agriculture, providing an opportunity for residents to grow their own vegetables. Onsite cisterns hold approximately 43,000 gallons of water, saving about 450 potable gallons of water per day through the rainwater catchment system. The cisterns reduce demand on Seattle’s water supply and slow the discharge of stormwater to the city’s sewer system. Large bioswales on the east and west perimeters of the site, filled with native sedges and rushes, remove 92% of contaminants from 190,000,000 gallons of untreated stormwater annually. This is equal to about 580 acres of untreated surface runoff. 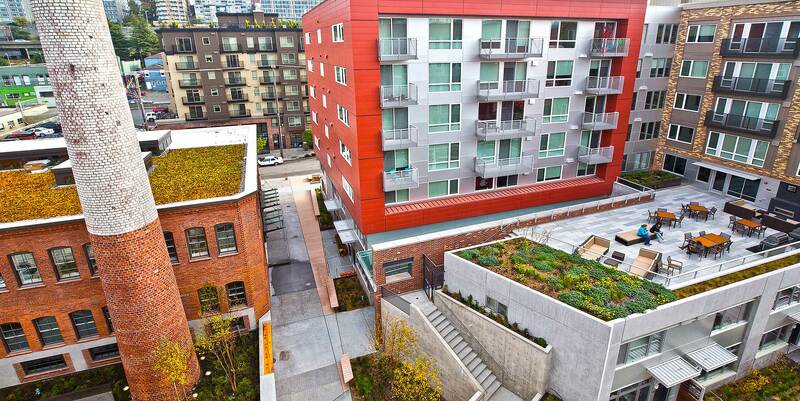 The bioswales were installed in partnership between the developer and Seattle Public Utilities. The bioswales significantly reduce contaminants discharged to Lake Union and provide additional greenery and habitat on the public right-of-way. Stack House also utilizes energy saving measures that are standard in sustainable buildings. Daylight and motion sensors cut electricity costs by 50% in corridors. The units and amenity spaces are equipped with high-performance lighting and low-flow plumbing fixtures. Energy efficient windows throughout and external sun shades help to reduce the heat gain, while the slab edge insulation reduces heat loss. 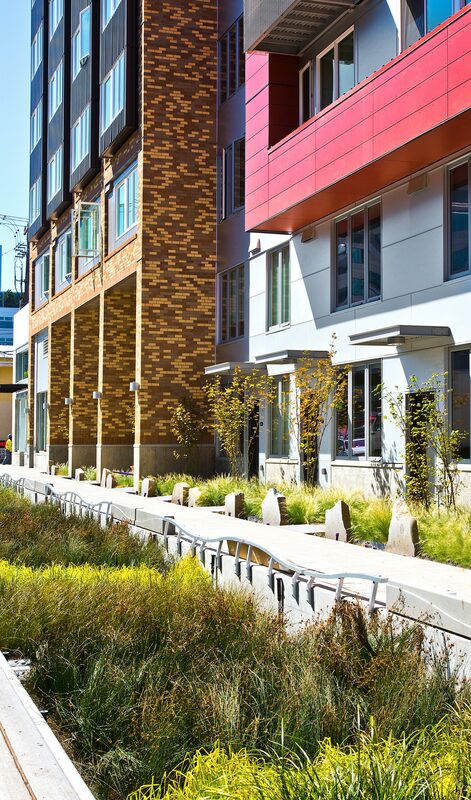 Stack House Apartments leverages cutting-edge energy savings features to achieve significant energy savings: The entire building has a measured Energy Use Intensity (EUI) of 22 kBtu/sf-yr, translating to 51% in energy savings. Overall, the Stack House Apartments and Supply Laundry building are paving the way for innovative design and sustainable practices. The project team saw the opportunity to leverage existing and new construction in a creative, sustainable, and community-friendly manner that conserves natural resources and supports the city’s greater environmental- and historic-preservation objectives. The project team was successful in achieving these results while also exceeding national industry standards for energy savings.